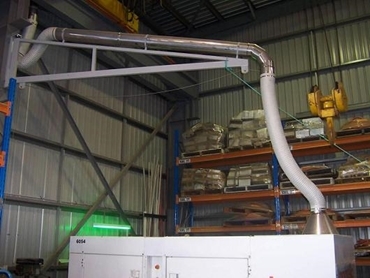 Polex Environmental Engineering was given a design brief from a generator hire company based in Kalgoorlie, WA to supply and install a generator exhaust fume extraction system. The system needed to extract exhaust fumes from a range of generators during start-up, operating one at a time. A swing arm was required with 4m of horizontal reach in order for the exhaust hood to align above the generator exhaust outlet. The ducting needed to have the capacity of withstanding high generator exhaust fume temperatures. The hood to capture the fumes had to be designed to enable easy raising and lowering when required. Additionally, the fan was to be located on the roof of the building with acoustic treatment to minimise noise emissions. Polex designed a comprehensive fume extraction system consisting of a powder-coated, heavy duty swing arm complete with bearings for easy rotation of the swing arm, a 4kW centrifugal extraction fan rated for 3000 m³/h airflow, stainless steel 304.2B ducting between the swing arm and the fan, flexible ducting with 200ºC temperature resistance as well as a fan inlet silencer and acoustic fan enclosure. The generator exhaust fumes were effectively removed by the new fume extraction system, resulting in a clean and safe work environment at Aggreko.